That Divinity: Original Sin is already well over a year old troubles me. “Surely it came out this year,” I yell at my screen as I watch my hair turn grey and my skin wrinkle. In the corner of my room, the Grim Reaper laughs. The passage of time is terrifying, but at least the folks at Larian have made the most of the last year, lavishing improvements on the game. Over 1,000 of them, in fact. 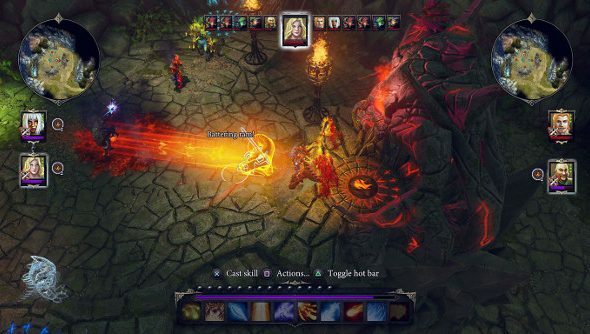 And you can see them now, as Divinity: Original Sin – Enhanced Edition has launched. Curious about Divinity: Original Sin 2? Check out our Divinity: Original Sin 2 hands-on. Controller support, a revised story, dynamic split screen and whole new game modes are just some of the changes that Larian have crammed inside an already large game. Take a gander at this here trailer that spotlights a few more. When I visited Larian in September, I managed to sneak in a wee bit of time with the Enhanced Edition, and was quite impressed by the improvements, particularly the tactical mode that makes it so much easier to manage the battlefield. I even played using a PS4 controller without having some sort of stress-related panic attack. If you’re desperate to play Divinity: Original Sin 2, then you might be able to sate yourself on this Edition for a wee while. A lot of the improvements have made their way into the sequel as well. If you fancy reading the full list of changes, take a look at this PDF. And it’s especially worth noting that owners of the original game get this as a free upgrade. Nifty.